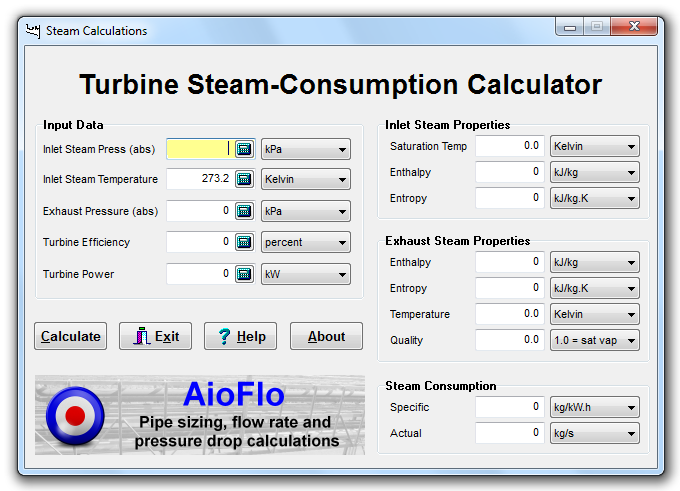 This free program will calculate the steam consumption for a turbine of known power and efficiency. The required data are the inlet steam pressure and temperature, and the exhaust pressure. The program will determine the specific and actual steam consumption, and the outlet steam enthalpy, entropy, temperature and quality. The program is very easy to use because all the required steam properties are built in. A wide variety of units of measure are included, and once you have selected the units you prefer to use, the program will remember your selection from run to run. All the input fields and the calculation results are shown in a single window. The units can be set for each input or result field, and the selections will be retained for the next time the program is run. Click here to download the full free software package (895 kb). This package includes easy-to-use install and uninstall routines, as well as the complete software program and help files. This program has been developed in conjunction with The Sugar Engineers' Library and is supported by them. The Turbine program runs under Windows XP / Vista / Win 7 / Win 8 & 8.1 / Win 10. Once it is installed it requires only 1.0 Mb of disk space. The current version is 2.4 and is dated March 2013.